Old Testament heroines feature prominently in Jan Massys’s body of work, particularly as nudes. 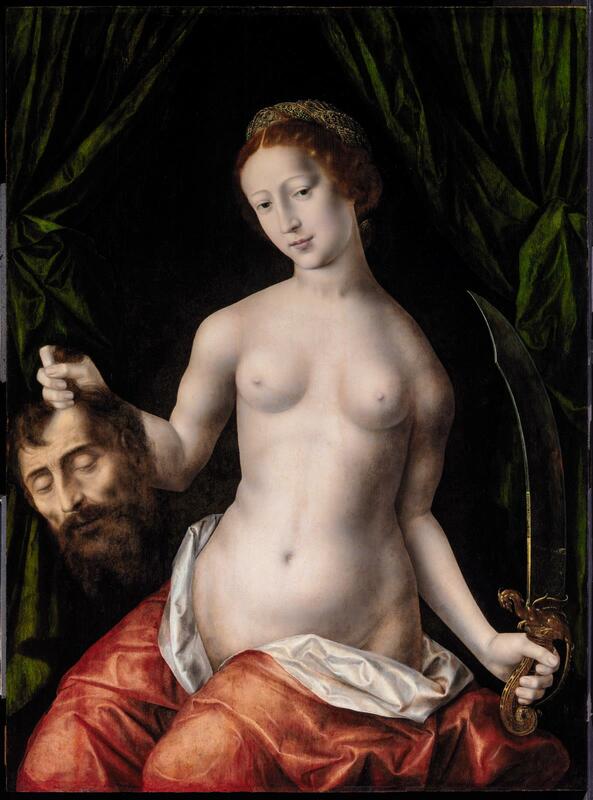 Here he portrays Judith, who saved her fellow Israelites from the forces of Assyrian king Nebuchadnezzar by beheading his general Holofernes. She used her beauty to first win his trust. Massys’s sensual interpretation of the subject is consistent with the 16th-century trend of depicting Judith as a beguiling seductress rather than a virtuous conqueror. This is the earliest signed work by Massys, whose father, Quentin, was an influential Netherlandish painter. William Turner Dannat was an American painter who worked in Spain and settled in Paris. He acquired several paintings in Spain, probably including this one; according to notes in the MFA curatorial file it had been in a private collection there. When and how it came into Dannat's possession, however, is not known. He lent the painting to the "Exposition des Primitifs Flamands à Bruges" (Bruges, 1902), cat. no. 241.